There’s been an overall legislative review of workplace legislation in a number of provinces. Alberta implemented Bill 17: The Fair and Family-friendly Workplaces Act in June 2017, and there’s a review coming for British Columbia’s workplace legislation. Ontario’s Bill 148: The Fair Workplaces, Better Jobs Act, mirroring similar changes to Alberta, received royal assent in November 2017, with the bulk of the changes in effect this month. Keith Murray, Western Canada managing partner at Mathews Dinsdale & Clark LLP, says there’s certainly a lot of focus on legislative change. One of the more notable — and controversial — changes in Ontario, Alberta and federally is “a real swing back” to card-based certification, making it easier for unions to organize. “In B.C., the issue of whether they’ll go to card-based certification is very much still in play,” he says, noting the NDP government wants to follow Alberta, Ontario and federal changes but the Green party, whom the NDP doesn’t have votes to do it without, aren’t currently in favour. However, he does expect changes in B.C. as well. Employees used to being $3 or $4 above minimum wage will see it jump to almost their current pay, and Ontario employers will have to look at how to deal with that, Sherrard says. It’s not complex labour and employment law, he notes, but it will affect everybody. Craig Rix, partner at Hicks Morley Hamilton Stewart Storie LLP in Toronto and member of the firm’s executive committee, says Bill 148 “has been an absolute spotlight on labour and employment in 2017,” noting the firm has run “about a dozen” sessions for clients and could probably run a dozen more. “The benefits of a boutique is the ability to partner with our clients and in partnering with our clients they’re reaching out to us to help them get ready to comply,” he says. Sherrard thinks there’ll be a significant increase in employment standards compliance work for employment lawyers, and he also expects more activity for labour lawyers providing services to federally regulated employers in the wake of recent Canada Labour Code changes. Goldblatt says another area that’s on the rise is harassment, discrimination and conflict generally within the workplace. “I think most of the firms have experienced significant increase in harassment complaints within their clients,” says Sherrard, including the investigation of complaints and advice surrounding the outcome. Though there has been recent legislation in Ontario dealing with the issue, Sherrard agrees with Goldblatt in that it may be a societal shift causing the increase. Similar to Ontario, Murray says there is “certainly now a heightened awareness or sensitivity to issues of harassment in the workplace, both sexual harassment and general bullying” in Western Canada as well. His firm has seen an increased interest from employers for training and education, and an increase in complaints from employees that they’ve been exposed to inappropriate behaviour resulting in more investigation work. “There’s nothing new on the legislative front out here in that area, so I think it’s being driven by the greater media attention being placed on the issue,” Murray says, adding he too thinks people are more comfortable speaking up and bringing forward complaints than they have been in the past. There are other areas of change as well. For Rix, technology has done a great job of breaking down traditional geographic boundaries. While everybody will continue to say that people can’t be impaired in the workplace, legalizing the drug will “start to put challenges into the system,” he says. Legislative changes usually result in employers and unions seeking more advice and managing more disputes while the meaning of the legislation is worked out, Murray says. Barteaux Durnford was founded in 2015 on the reputations and employment and labour experience of Eric Durnford and Nancy Barteaux. With a focus on management issues, the firm’s growing team of lawyers represents private and public employers and First Nations communities across a diverse range of business sectors: education, fishing, construction, technology, hospitality, entertainment and non-profit organizations. A homegrown labour and employment boutique in Atlantic Canada, Barteaux Durnford is known for successful outcomes in negotiated settlements, arbitration, litigation and collective bargaining. The firm provides solutions on day-to-day matters and conducts independent workplace investigations. Barteaux Durnford serves multinational operations locally and abroad as Atlantic Canada’s only member of the Employment Law Alliance, a global network of select employment and labour lawyers. Founded in 1982 by Warren Winkler, Roy Filion and David Wakely, this 43-lawyer firm acts exclusively for employers in diverse sectors of the economy — from energy and manufacturing to healthcare, education, transportation and government. Clients include Enterprise Rent-a-Car, National Car Steel, Roots and McMaster University. Filion cites depth of experience and a focus on its clients’ businesses as its greatest strengths. The firm’s lawyers are regularly recognized for excellence, including most recently the Canadian HR Reporter 2017 Employment Lawyer of the Year (Jamie Knight) and the Lexpert Zenith Awards, celebrating women in the law. Filion is the single Canadian member of L&E GLOBAL, an alliance of over 1500 employers’ counsel worldwide, giving clients requiring complex cross-border labour and employment services access to a single global legal powerhouse. Harris & Co. LLP’s roots date back to the labour department of Campney and Murphy, a large general practice in Vancouver which formed in the late 1940s. Ten lawyers stepped out in 1992 to found a boutique labour and employment law firm that has grown to become a management-side workplace law and advocacy firm in Western Canada. In addition to labour and employment, Harris’ 45 lawyers also practise in privacy law, workers’ compensation, occupational health and safety, administrative law and education law. In the public sector, the firm represents many of the post-secondary institutions and health authorities in the region; as well as the province’s 60 public school boards. Harris practitioners advise leading companies in the entertainment, forestry, airline, food and construction sectors, amongst others, and have acted in some of the most high profile litigation cases and strategically important labour and employment negotiations in the province’s history. Toronto, Waterloo, Kingston, Ottawa, London, Ont. With over 120 lawyers in five cities across Ontario, Hicks Morley is a law firm focusing on management-side human resources law and advocacy issues. The firm offers clients a full range of strategic advice, risk assessment, consultation and training on all aspects of labour relations, employment law and pension, benefits and executive compensation law. Now in its 45th year, Hicks Morley has extensive experience representing provincially and federally regulated employers in both the public and private sectors across the country and frequently advises on matters which are national in scope. Mathews Dinsdale is a labour and employment boutique with a presence across Canada. With more than 60 lawyers in six cities from coast-to-coast and connections to the Ius Laboris global network of HR law firms, it assists employers with all their local, national or international workplace needs. Some of the firm’s clients include Ellis Don Corp., Progress Energy, Scotiabank, Cargill Ltd., Shoppers Drug Mart, Porter Airlines, St. Mary’s University, Fairmont Hotels and Sofina Foods Inc. Recent successes include securing an order from the Ontario Labour Relations Board declaring a union-led plant occupation to be unlawful, overturning a Saskatchewan Labour Relations Board decision in the Court of Appeal relating to the application of the “build up principle” in the construction industry, and upholding the termination of an employee with a marijuana addiction for repeated abusive behaviour towards management. Neuman Thompson was established in 1977 by Ron Neuman and Brian Thompson as a labour and employment law boutique serving employers in Alberta. The firm has grown to 12 lawyers who provide all types of labour and employment law advice to local, national and international clients throughout Western Canada. Through its membership in the Employment Law Alliance, Neuman Thompson offers clients ready access to high quality and specialized local expertise across the country and in over 100 countries worldwide. The firm works with a broad range of employers in both the public and private sectors. It serves governments, public agencies, major health care providers and post-secondary educational institutions. The firm’s roster includes clients such as Alberta Health Services, Epcor, Suncor, Agrium as well as other private sector clients in the industrial, manufacturing, oil sands, forestry, agribusiness, transportation, continuing care, communications and retail industries. Established in 2006, Roper Greyell LLP is among the largest labour and employment boutique firms in Western Canada with national reach through its membership with the Employment Law Alliance. This 31-lawyer firm represents clients in most areas of the Canadian economy including construction, forestry, marine transportation, mining, health care, post-secondary education, retail, public transportation, utilities and the municipal sector. The firm practises in all areas of employment and labour law including human rights law, disability and accommodation, workplace investigations, employment litigation, privacy law, workplace bullying and harassment, collective bargaining, employment standards and workplace health and safety issues. Rubin Thomlinson’s employment law practice focuses on conducting workplace investigations, assessments and workplace remediation. Founded in 2003 by Janice Rubin and Christine Thomlinson, the 13-lawyer firm works across the country and has conducted various high profile investigations/reviews for the CBC, the Canadian Olympic Committee and the Government of Newfoundland and Labrador. The firm has also developed an extensive training curriculum that aims to better support and enable employers and other institutions to conduct investigations internally and resolve human rights and other workplace related issues. The firm is building out its national network and intends to add a practice in Calgary in 2018. The Toronto-based law firm of 27 lawyers serves clients in a wide range of industries and sectors in both unionized and non-unionized workplaces. In operation for 17 years, the firm’s client-base is national and international, in both the public and private sectors. The firm’s areas of practice include: advising the multinational and multi-jurisdictional employer; Industrial Relations Board proceedings; collective agreements and bargaining; compensation and benefits plans; construction labour relations; employee relations; executive employment agreements and compensation; grievance arbitration; human rights and accommodation; injunctive court proceedings and judicial review; interest arbitration; Labour Relations Board proceedings; management training; mediation and alternative dispute resolution; occupational health and safety; outsourcing; pay equity; privacy; responding to union organizing and applications for certification sale or closure; strike or lock-out preparation and business continuity planning; workplace investigations; workplace safety and insurance; wrongful and constructive dismissal litigation. The firm has an alliance with Roper Greyell in B.C. Whitten & Lublin is a growing firm. The firm was founded by David Whitten and Daniel Lublin in 2009 and has quickly grown to 12 lawyers, all with experience advising both employers and employees throughout Canada, with an emphasis on dismissal-related litigation. The firm’s list of corporate clients has rapidly expanded as word gets out and includes one of Canada’s largest engineering and consultancy firms, the world’s largest helicopter manufacturer, one of Canada’s largest security companies, as well as a global auto manufacturer and cosmetics company. CaleyWray is a full service labour firm that has been serving trade unions and working on behalf of trustees/trust funds for over 40 years. The firm provides representation to its clients in all areas of law that impact trade unions and their members. CaleyWray acts for a variety of clients in construction, health care, industry, manufacturing, transportation and service. Clients are in the public and private sectors and the firm represents them in both federal and provincial jurisdictions. 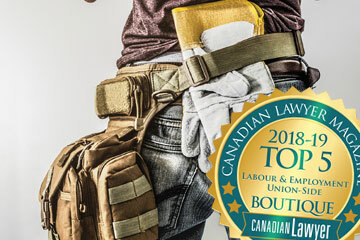 The firm’s lawyers work in all labour-related forums including grievance arbitration, federal and provincial labour boards, human rights tribunals and workers compensation tribunals. CaleyWray lawyers also attend court on behalf of clients for matters including judicial review, injunctions and bankruptcy proceedings. Paul Cavalluzzo, Jim Hayes and Elizabeth Shilton founded the firm in 1983 with a focus on social justice and equality. The 35-lawyer firm now represents clients such as the Ontario English Catholic Teachers, the Elementary Teachers’ Federation of Ontario, the Ontario Nurses Association, and Labourers’ International Union of North America. The firm’s mandates include representing the Canadian Civil Liberties Association and Canadian Journalists for Free Expression on the Bill C-51 constitutional challenge, serving as counsel to Canadian non-residents in their constitutional challenge relating to their right to vote, advocating on behalf of complainants and the CCLA in the disciplinary hearings in respect of police “kettling” during the G20 summit in Toronto, representing Grassy Narrows First Nation in their dispute with Ontario and Canada over mercury poisoning and recently appearing in the Supreme Court of Canada in the Groia Appeal. Goldblatt Partners has represented trade unions and professional associations in all aspects of labour and employment law for over 40 years. From a 4-lawyer office in the mid-1970s, the firm has grown to 50 lawyers in Toronto and Ottawa. It serves a broad client base of trade unions, including labourers, education and hospital employees, university faculty and municipal employees, as well as lawyers, physicians and judges. The firm has represented the Canadian Labour Congress in numerous Supreme Court of Canada freedom of association and equality rights cases and has also worked with international organizations seeking to protect workers’ rights. It has civil litigation and criminal law practices, which often intersect with the labour law practice. Other public interest cases include unpaid overtime class actions against Canadian banks and other employers and minimum wage class actions on behalf of junior hockey players. Pink Larkin is a dispute resolution law firm. Evolving from a “work law” heritage in employee-side labour law, the firm has honed its negotiation skills to resolving problems that range from complex high-level conflicts and intricate cases to everyday business issues. Privately held enterprises, community groups, professional associations and organized labour trust Pink Larkin to help them manage and resolve issues related to high-stakes risk management planning and when necessary, take measured responses and appropriate action to manage disputes and protect interests. Legal services include employment, labour, litigation, mediation, human resources, workplace investigations, professional regulation, workplace coaching, pensions and benefits, non-profits, first nations and human rights. In addition to being litigators, mediators and advisors to individuals, organizations and business, Pink Larkin launched a full-time pro bono practice focused on systemic litigation that presents law reform possibilities for the poor — a first-in-Canada approach to actively providing access to justice. Ursel Phillips Fellows Hopkinson LLP traces its history back to the original union-side labour relations firms in Ontario: Joliffe, Lewis and Osler and Golden Levinson. The firm’s 22 lawyers provide legal services to trade unions, employee associations, progressive organizations and employees with respect to all aspects of the work relationship, including labour relations litigation, human rights, pension and employment benefits, health and safety, workers’ compensation, professional discipline, criminal defense, civil litigation including appellate work, Charter of Rights and public interest advocacy and class actions. The firm has a demonstrated commitment to the interests of its clients and to progressive movements throughout Ontario, Canada and the world. Great job! You have shared a nice post. I really appreciate the efforts you have made. You have conducted thorough research and written a great post. Looking forward to seeing you soon in a new post.